This page talks about the Cast and Cure™ process and how it works. If you are looking for information about DGM’s Cast and Cure™ machine, please visit our Filmdex™ page. The Cast and Cure™ holographic effect is achieved with a lithographic printing process utilizing UV technology and a nano-embossed casting film within a controlled system. Cast and Cure™, previously referred to as UV film casting, was first introduced in Japan in the early 1990’s as an off-line process and has only recently progressed to an in-line process with the introduction of newly developed equipment. The process involves using a polypropylene film which has a nano embossed pattern embedded into an emulsion coating on one side of the film. The depth of the emboss is 200 nanometers. There are many wallpaper patterns available and preparatory patterns can be made. Wallpaper patterns are purely for decorative effect while preparatory patterns can be used for product identification or covert security purposes. 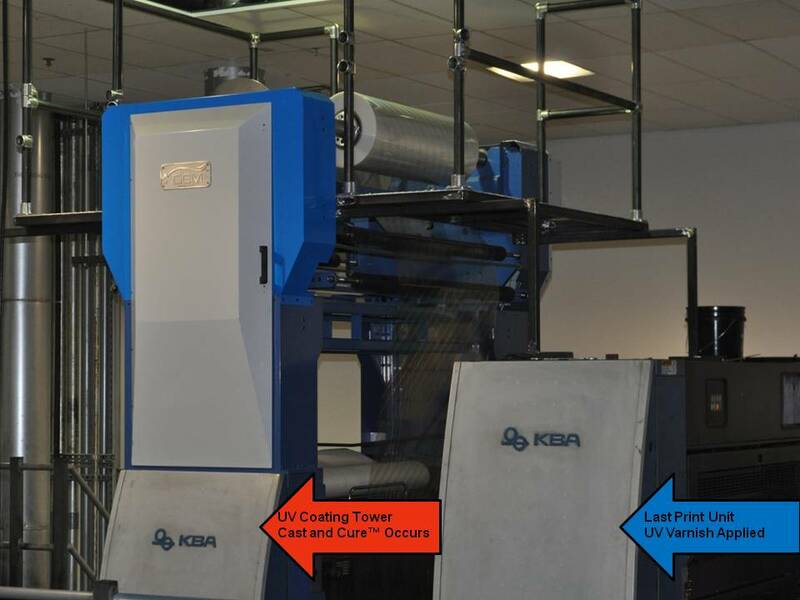 Two printing towers of a lithographic printing press are used. On the first tower a UV varnish is applied to the substrate by a standard lithographic printing plate in the pattern desired. On the second unit the nano-embossed film passed between the blanket cylinder and the impression cylinder. The nano-embossed pattern is pressed into the wet varnish while a UV light source cures the varnish thereby locking in the pattern. After curing, the film is removed from the substrate to be rewound for subsequent use. With a properly controlled rewind system the film can be reused up to 12 times. The system operates at machine speed and because the film is reused there is no additional material added to the substrate. This equates to a low cost, highly decorative application with a very small environmental footprint. Cast and Cure™ Application Systems mount on top of your printing press and work within the parameters of the press’ software operations and specifications. The system is aesthetically designed to match the host press. Converting back and forth between normal printing and Cast and Cure™ applications is as simple as your normal job change over. Cast and Cure™ is Recyclable, Reusable, Remarkable! Cast and Cure™ is a Sustainable Manufacturing Process in which the Cast and Cure™ film is fully Recyclable. The Cast and Cure™ effect is created using a recyclable UV coating or UV varnish and does not emit any harmful VOC’s. Cast and Cure™ also reduces your overall carbon footprint. The Cast and Cure™ film is re-usable multiple times. There are many stock Holographic patterns to choose from. You also have the ability to create a Custom Designed Pattern which can be used for Brand Protection and Anti Counterfeiting. Cast and Cure™ is an excellent process for creating a cost effective visual impact to help a customer’s product stand out amongst the competition. The Cast and Cure™ effect is created at a fraction of the cost of other finishing processes and is, environmentally, a better solution to Laminated Foil Board. Cast and Cure™ is remarkable as it creates a stunning holographic effect onto the printed substrate in a variety of designs performed in-litho register, at press speed through your printing press with UV Capabilities. Cast and Cure™ is an amazing sustainable packaging solution for your customers who desire a high impact visual effect. As the need to offer solutions which are environmentally friendly continue to increase, Cast and Cure™ is becoming the future of the industry. With many companies wanting to steer away from metalized products, such as foil-board, Cast and Cure™ is a value added in-line finishing solution that reduces your overall carbon footprint. The Cast and Cure™ process uses Energy Curable UV Coatings and Varnishes which are solvent free and also a renewable resource. Cast and Cure™ does not emit any greenhouse gases during the process and also does not contain any VOC’s (Volatile Organic Compounds). The Cast and Cure™ film is reusable multiple times and is also recyclable. Visit FSEA Website for more information on the Recycling Study as it relates to Foils and Films. 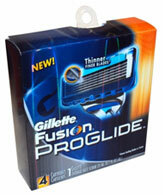 Proctor and Gamble has used Cast and Cure™ to update their package and its design for the Prilosec OTC line. Proctor and Gamble has seen their impact on the environment and has reduced their landfill waste significantly. Visit FutureFriendly.com for more information on the Prilosec OTC Study.